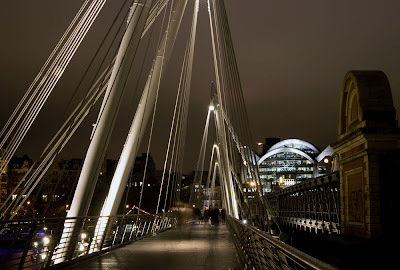 I have posted a glimpse of the Golden Jubilee Bridge before showing a daytime view. Same bridge, different angle, different time. WOW, thanks for making me a blogger of note. I will respond to everyone but it may take a wee while. Those of you have been following this blog know I am travelling at the moment, so my postings and responses to you are a little erratic based on my ability to get online. It's just a detail, but the steel-like featureless sky is overwhelming. People are in the right distance and perspective: they serve as a scale to the surrounding structures. Very nice detail too. You have another daily visitor, that's for sure. Excellent picture! The colors are amazing...as is the picture. Again, so glad this is on my RSS Reader. London is really magic by night. It fascinates me over and over again. I love walking onto this bridge! Ciao. A.
wow! that is such an awesome picture!! I can't wait to travel there!! i found this blog on "blogs of note" and i have found a new favorite! i am obcessed with london and i love the photos! Great pictures. London seems to look a lot better then what we see on Coronation Street.The living conditions on Coronation Street, are very similar to welfare housing projects in North America. Kudos! Blog of Note is was well deserved. Your photos are really breathtaking! This is one of my favorite blogs. Alot of awesome posts. I really enjoy looking at your daily pics--what a fabulous idea! I'd love to visit London some day. So far, I have Paris and Germany under my belt. Thanks for show me a special London. I just have to say that this blog is great! I am a total fan of London and spend as much time there as possible. I am really new to blogging everyday, but I have done travel blogs before. My last one was when I went to London last March. I really do enjoy the city and I am very jealous that you are there! Cool picture. You came up as a blogger of note, so I check your blog out. Nicely done. Yes, awesome pick indeed! Looking forward to my visit back again in April, assuming I can work out the logistics and timing!! I spent (sadly) just 3 days in London last April, I loved it and miss it very much. Thanks for reviving some wonderful memories. London is an excellent city!! Wow, amazing picture..I am in awe!! I grew up there and haven't really been back since. Seeing these pics make me want to take the trip back over the pond. Nice pics and keep it up! Beautiful photos. I'm a southerner living in China at the moment - I miss London! Another great night shot! Congrats! Great shot - I took some similar ones myself recently but, as usual on this bridge, ended up concentrating on the Eye across the water. Wow! I love the pictures! I'm an artist myself, though I use a completely different medium. If you want to see some of the crazy and wild things I do, check out my websire. I will tell you that some of the pictures may blow your mind.... Just like many of your photos inspire me. Thanks again for the posts, Love em! The pictures are beautiful. I can't wait to visit someday. London has always been a forefront for architectural amazement and advancements. The Golden Jubilee Bridge in this view seems to create an odd bit of warmth in a seemingly cold and featureless night. Amazing shot, make sure to enjoy your travels and take plenty more. London at night is better than London during the day for photographers it seems. this one is too god!! Well done to you Mo. As you know I've been out of the loop this week but just discovered you were made blog of note. What a fantastic achievement, you deserve it. Your photos and your blogging style are always a joy. I look forward to much more. I love this photo. The angle is wonderful! The shots you took were all fantastic. Man. London's so gorgeous. I promise I'm gonna go there someday. Wow! This is an absolutely breathtaking picture! I'm sure it looks even better when you're actually there. I'm late, I'm late - but with no less feeling - so pleased you've been awarded a Blogger of Note award. Very well done, Mo. Delighted for you and well deserved. wow, what a splendid scene! i like the deserted feel of it. Today is the first day I have entered in your blog, and it has surprised me a lot. What a lovely pic! I walked across that bridge earlier this week on a very brief visit to London, but my pics didn't turn out nearly that well. Ah sure, must try harder next time!